Bus from Singapore to Shah Alam is the cheapest and most convenient transportation to arrive at Shah Alam. By taking direct express bus from Singapore to Shah Alam, passengers can save their time to travel to Kuala Lumpur TBS to take transfer bus or KTM Komuter to Shah Alam. StarMart Express is the only bus operator providing direct bus service from Singapore to Shah Alam. Bus service from Singapore to Shah Alam is frequent and have total up to 7 daily departures. StarMart Express bus from Singapore to Shah Alam runs daily between 11.00am and 11.59pm. StarMart Express operates the route with 27 seats S.V.I.P single-decker coach. Coach provided by StarMart Express is spacious and secured to ensure passengers having comfortable journey. The duration for bus from Singapore to Shah Alam takes about 6-7 hours, depending on the traffic and weather conditions. Because all coaches in Malaysia do not install toilet facility, therefore at least one washroom break will be given during the journey. Additional break will be given upon request to the driver. The bus fare is reasonably charged from SGD 33.00. Bus fare may be adjusted higher during long weekend and festive seasons like Chinese New Year and Hari Raya. There are three boarding points in Singapore to choose from for bus service to Shah Alam. The first is at Golden Mile Tower which is the prominent bus hub in Singapore. Additional pick up point provided by Starmart Express are City Plaza at Geylang Road and Park Royal Hotel in Little India. All coaches from Singapore to Shah Alam terminate at Shah Alam Bus Terminal. 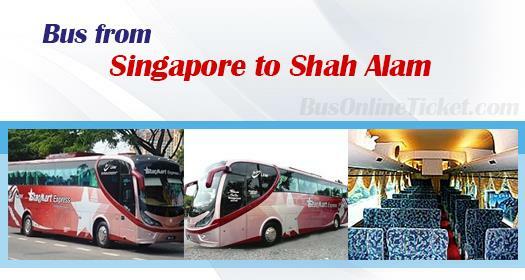 Even there are many departure schedules from Singapore to Shah Alam to choose from, passengers are advised to purchase bus ticket online with BusOnlineTicket.com to avoid disappointment. BusOnlineTicket.com is the reliable and user-friendly online booking portal. BusOnlineTicket.com allows you to purchase bus ticket online in anytime and anywhere as long as you have internet access.